One of the most annoying tropes of modern intellectual life is that the material abundance of liberal market societies has come at the cost of increasing unhappiness and unease — the “paradox of prosperity,” I call it. Over the past half-decade, a raft of books has been devoted to our allegedly paradoxical ennui. Examples include The Progress Paradox, by Greg Easterbrook, The American Paradox by David Myers, and The Paradox of Choice by Barry Schwartz. But the paradox of prosperity is a myth. The multidisciplinary field called “happiness research,” from which all these books draw, now shows that, other things equal, prosperity makes us happier. Wealthier individuals tend to be happier. 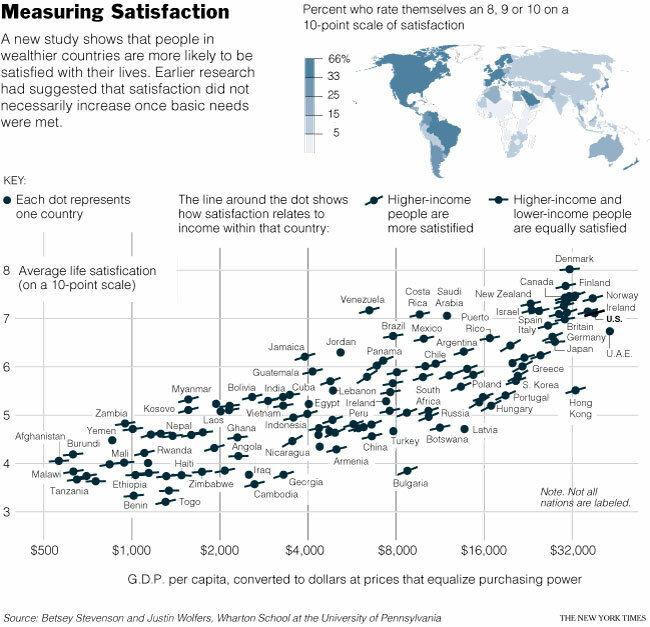 Wealthier societies tend to be happier. Average happiness tends to rise in places where average wealth is rising. For the paradoxicologists, these are inconvenient truths indeed. The point of substituting measures of psychological well-being for crude economic measures was to show that a society that delivers the goods doesn’t thereby deliver the good life. The happy-seeking heart craves the solidarity and egalitarian comfort of Northern European social democracies. So freaking what if the socialists got completely drubbed in last century’s fight over which socioeconomic system best creates material prosperity? Material prosperity is overrated! Except, it isn’t. Live by data, die by data. Of course, one may always choose to impugn the data when it gives the wrong result. Anyway, isn’t it ridiculous to try to measure happiness, of all things? What cold caliper can span the infinite soul!? I have questioned the reliability of the data myself, at length, and recommend measured skepticism of findings based on the prevalent survey-based methods–even of the findings I like! But, no: it isn’t ridiculous to try to measure happiness. There is little agreement on what happiness is, exactly, which might seem to pose a problem. But whatever you think the elements of happiness are — second-to-second pleasure, a sense that life is going well overall, a feeling of engaged self-efficacy, whatever — we can try to measure that. And we’re only going to get better at it. The empirical study of the seemingly intangible is only beginning to flower. The labcoats are putting divines in the FMRI and college kids the world over are having their moral intuitions scraped. If you haven’t heard, trust can be nasally administered. More interesting, and much more compelling, were those who chose to admit the evidence, but argued that happiness isn’t everything. Sure, family can be a pain, but it’s meaningful. Indeed, the Newsweek article that imparted the unhappy news to a broad American audience noted that “parents still report feeling a greater sense of purpose and meaning in their lives than those who’ve never had kids.” If meaning an excellent reason to have children (and I’m not saying it isn’t), perhaps it is also at least as good as happiness as an argument for generous child tax credits. And with meaning firmly in hand, perhaps happiness mavens disappointed by the numbers can jump from one paradox of prosperity to another. Appeals to meaning are nice, but they just push the lump in the rug. What’s so great about meaning, anyway? For that matter, what is it? How does one validate that x is in fact meaningful, or more meaningful than y? If meaning is going to carry a justificatory load in weighty personal and political deliberation, we can’t just wave our hands about it. Intellectual virtue requires care. We need get started on measuring meaning. There are many questions. How much is meaning worth to us in terms of happiness? How much is happiness worth in terms of meaning? There are no doubt many and varied sources of meaning. With science on our side, we are sure to discover that some them are corrosive to other of our cherished values while some enhance them. Then we’ll be well-situated to say goodbye to toxic meaningfulness. Goodbye national identity? Goodbye God? Who knows what we might find? Science is a source of excitement as well as wonder. I don’t anticipate the new field of “meaning research” will be warmly received by those with a refined taste for meaning. Many of these fine folks say that the very attempt to measure happiness scientifically — not to mention the effort to put meaning itself under the microscope — saps life of… meaning. But how do you know? Anybody can say this. You can say it while waving a copy of The Closing of the American Mind. You can say it smoking a pipe. But it doesn’t help. There is certainly more than one way of winning an argument, but there’s just one way of knowing: the empirical way. If there’s a way of knowing something about meaning–including whether measuring meaning threatens meaning–that’s the way. There is nothing wrong with the pursuit of happiness. There is nothing wrong with the pursuit of meaning. But there is more than a little something wrong in blind pursuits when the means to enlightenment are at hand. Next PostNext Let's Measure Meaning!